British Politician, broadcaster,political analyst, Contributor of Fox News. Nigel Farage is best known as the leader of the UK Independence Party (UKIP),(2006-2009) and also from 2010 to 2016. He is also identified as British Politician, broadcaster, and political analyst. He is also popular due to his controversial speeches in the European Parliament and criticism over euro currency. He is also recognized as Contributor of Fox News. 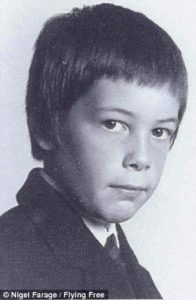 Nigel Paul Farage, son of Barbara(nee Stevens) and Guy Justus Oscar Farage, was born on 3rd April 1964 in Downe in Kent, England. His name Farage represents Huguenot ancestors who migrated from German to London in the 19th Century. His Grandfather, Private Harry Farage was a warrior of World War 1 and his father worked as Stockbroker in City of London. His father left family home when Nigel was only 5 years old. Nigel Farage admitted at Dulwich College (1975-1982), an independent school in South London. He didn't join University for further education after leaving School in 1982. He started to work in trading commodities, London Metal Exchange. Initially, Nigel Farage worked in a brokerage firm, Drexel Burnham Lambert, an American Commodity Operation in 1986. After that, he worked in Refco, New york based financial service company and Natexis Metals, French Corporate and Investment Bank in 1994 and 2003 respectively. Nigel Farage, who has a keen interest in politics since his school days, first joined "Conservative Party", the political party in the United Kingdom. But, he left the Conservative Party in 1992 and became the founding member of UKIP in 1993. In 1999, he was elected to the European Parliament and also reelected in 2004, 2009 and 2014. Now, he is the leader of the 24-member UKIP contingent in the European Parliament and co-leader of Europe of freedom and Direct Democracy and multinational Eurosceptic group. Nigel won with maximum votes and was elected as leader of the UKIP on 12 September 2006. Nigel focussed on maximizing the UKIP's representation in local, parliamentary and other elections.Nigel Farage mentioned in a speech on UKIP conference on 8 October 2016 that UKIP was the center ground for British Public Opinion and Real Voice Of Opposition. Nigel resigned from the leadership of UKIP on 8 May 2015 due to his failure to get a seat in the General election of "South Thanet", the constituency represented in the 'House of Commons' in UK Parliament. However, he changed his decision and BBC reported that he will continue as leader of UKIP. In May 2013, UKIP with led Nigel Farage received 23 % of votes in the local election and was ahead Liberal Democrats by 9 points, winning 147 council seats. Nigel Farage was also engaged in the campaign to become a member of Parliament for Buckingham at Westminster in 2010. During the general election, 2010, he got 8,401 votes and came third. In 2014 European Election, he led UKIP to win the highest share of the vote. Since the 1906 election, it was the first time ever to won the popular vote in a national election except for Labour Party and Conservative Party.Nigel also writes an article for The Independent of all places which have influenced some of the readers. He is also a regular contributor of a blog post on Breitbart.com. He was also active in U.S. presidential Campaign and also regarded as a contributor to Fox News. He is the presenter of LBC. On 20 April 2017, the former UK Independence Party, Nigel Farage said that he will not run for the 2017 general election. He wrote “I have decided that I will not stand in this election but fight for Brexit in Europe,” on The Daily Telegraph. Nigel Farage has been criticized several times due to his controversial statement that he shared with media. His comments during the Leader's debates, "HIV Positive migrants shouldn't enter the country" was highly criticized by the charitable organization of HIV/AIDS. 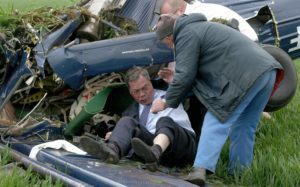 Nigel Farage almost died when he had an accident on May 6, 2010, due to plane crash during election stunt. It made headlines when he survived a terrifying plane crash with non-removable injuries on vertebrae. The accident occurs in the Hedges airfield, Brackley, Northants along with the Pilot, Justin Adam. According to Nigel, the plane, a Polish Wilgar was like old mini and it was very small that his and pilot's shoulder brushed out and was uncomfortable. Pilot, Justin suffered from mental illness due to an accident and also suffered from the financial problem. He also threatened Nigel Farage to kill him when Nigel claimed that Justin is the contributor of the accident. The pilot was found dead at 2013 at the age of 48 without any suspects. However, Nigel was fortunate to get a new life after the terrific plane crash. In 2016, Nigel Farage was described as one of the most effective speakers in the Chamber and ranked fifth influential MEP by Politico. Nigel is one of the richest politics personality, who has wages of 64,000 pound yearly. He possesses the property of approx. 5,40,000 pound.However, Nigel has claimed that he is the worst paid politician in British. Nigel Farage is currently living in London Borough of Bromley and is a member of "Church of England". He is very fond of fishing and drinking beer alone at night on the Kent Coast.He is also a member of East India Club, widely known for Gentlemen's club. He has appeared in an advertisement for the bookmaker Paddy Power in Golf's 2014 Ryder Cup. His favorite game is Cricket and Golf. Talking about his married life, he has been married twice. His first marriage was with Grainne Hayes, an Irish nurse in1988 and had two children, Samuel(1989) and Thomas (1991). The couple separated in 1997. Soon after, in 1999, he got married to a German national, Kirsten Mehr and are blessed with two daughters, Victoria (2000) and Isabelle (2005). Kirsten works as the secretary of her husband in European Parliament. Prior to her marriage, she worked as an interpreter for German Bank. 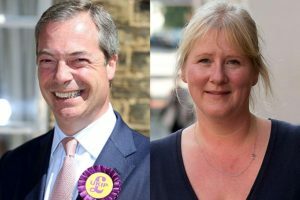 Currently, Nigel and Kirsten are living separate, which was confirmed after Kirsten told how her children used to suffer because of Nigel Farage with Press Association in February 2017. Nigel's second marriage also didn't turn happy ending as fairy tales. Nevertheless, they are not separated officially. Nigel Farage, who has a successful career as a Politician, Political Analyst and Broadcaster has an estimated net worth of £2.4 million ($3 million USD). Nigel suffered from testicular cancer but was cured in the first stage and is now living healthy and happy life in Single Street, Bromley, London, England.